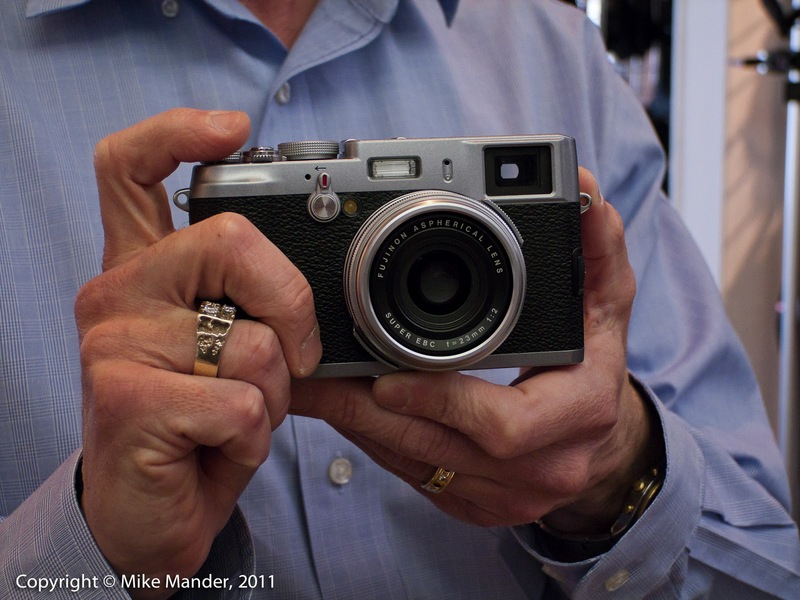 Mike Mander's Photo & Imaging Blog: Fujifilm FinePix X100: Hands on! I was told by the Fuji rep that the fit and finish of this camera were still clearly "preproduction quality" and that the final one would be even nicer yet. For example, the pleasantly tactile faux leather body covering will have a deeper and more accentuated texture on the final version and the bevelling and finish on the control dials will be ever so slightly refined. Honestly, even if nothing changed from the fit and finish of the one I handled, I seriously doubt anyone would have any cause for complaint! As far as the mechanical controls, the f-stop, shutter speed and exposure compensation dials all had a solid feel, with nice positive detents that just oozed quality workmanship. The heft of the body was appropriate, neither seeming too light nor feeling too dense: just a good solid camera that most certainly does not feel like a toy. The camera body is clad in magnesium alloy, so even though it is a light metal, it is still quite strong and does not feel plasticky or cheap. Before I go any further here, for some very detailed information, including several intriguing stories on how this camera came to be designed and refined, see Fuji's own FinePix-X100 website. Here is a link to a PDF brochure as well. I will just mention some of the key features in this blog preview with my personal thoughts and feedback based on the preproduction sample I handled for about 45 minutes. The X100 will most definitely be a professional tool, sporting a full APS-C sized 12.3 megapixel CMOS sensor with custom designed offset micro-lenses (similar to the Kodak sensors used in the Leica M8 and M9) as well as a highly optimized 23mm f/2 lens, equivalent in field-of-view to a 35mm lens on a full-frame DSLR camera. Fuji pulled out all the stops when designing this lens, pairing it up with great care to the large CMOS sensor. There is as much lens inside the body as outside, and the huge rear element is only a scant 5.6mm in front of the image sensor itself. A retrofocus lens design this is not! During the design of the optics, special attention was paid in achieving a smooth rendering of out-of-focus areas when shooting at wider f-stops, commonly referred to as nice "bokeh". Based on some sample images I've seen and on published MTF charts, this Fujinon lens promises to be exceptionally sharp in the center, even when shooting wide open at f/2 and stopping down even slightly should bring everything, including the extreme corners, into sharp focus as well. Please note that the lens cannot be removed... it is not an interchangeable lens design. The X100 is a fixed lens camera, albeit with a focal length equivalent that many photographers would consider pretty much ideal for a wide variety of situations. Indeed, many feel that the X100 may very well turn out to be a street photographer's dream camera. Ultimately, because of the highly optimized lens design that is mated so closely with the micro-lens array on the sensor, Fuji decided that achieving the best image quality was more important in their first X-series camera than the versatility of having interchangeable lenses. Yes, I did say "first" X-series. I am predicting there will be more X-series cameras coming in the future, based on hints in the "Fuji Guy's" Twitter feed as well as the tremendously positive response Fuji has received from so many photographers worldwide. Lastly, a few more advantages of a fixed lens design is in assembly quality-control (achieving perfect lens/sensor alignment), and in the sealed body design which should eliminate the frustrating problem of getting dust on the image sensor. In any case, since I was not able to take any photos myself with this early sample X100, I cannot actually vouch for its image quality yet, however based on many years of personal experience with Fujinon lenses, ranging from some of Fujifilm's superb P&S models (like their F30, F200EXR and S100fs), to medium-format rangefinders such as the GW690III, their GX617 panorama camera and the Hasselblad Xpan (which had its lenses made by Fuji), I have absolutely no reason to believe the X100 will disappoint. I have shot with many Fujinon lenses over the years and on anything other than their low-end consumer P&S models, they have proven to be very sharp with exceptionally flare-resistent coatings. 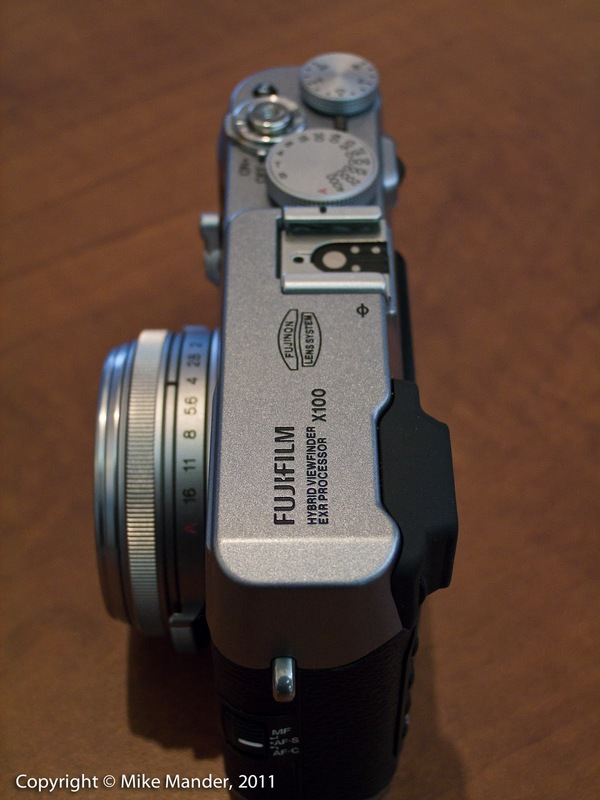 The X100 has a leaf-shutter (a small circular shutter inside the lens itself), rather than the more common focal-plane shutter of 35mm-sized cameras. The leaf shutter allows for near-silent operation and extremely high flash-sync speeds, up to 1/4000 second on the X100 when using smaller f-stops. I expect this camera will be one that movie-stills photographers will be all over, since with such a quiet shutter, they should have total freedom and likely be able to shoot without a blimp, even right next to a boom-mic operator. A "blimp" is the bulky sound-proof enclosure that one normally has to use on a DSLR in order to shoot freely during an actual filming "take" and frankly, using a blimp really is a pain! I have shot production stills on set a few times myself, and it would be a revelation to be able to shoot blimp-free... presuming a 35mm focal length is appropriate for the situation of course. Another thing that movie stills photographers need, is exceptional low-light performance so that shutter speeds can be kept up in order to freeze the action. It looks as though the Fuji will not disappoint here either, since after looking closely at some unauthorized high-ISO images from an early sample X100 that were posted on the Internet, I feel that the X100 will be right up there with the very best APS-C cameras. Shutter speeds will also stretch all the way to a long 60 minute maximum, so coupled with clean high-ISO and a large sensor, I expect the Fuji will do really well for time-exposure night photography, star-trails, light-painting and so on. One thing I found in many of the sample jpegs I've looked at, was how impressive the colour and dynamic range were, even from such an early preproduction camera. I am definitely looking forward to seeing the image quality in person and in shooting some raw files and processing them through CS5 or Lightroom, once Adobe has their software updated to support the X100 raw (.RAF) files of course. That said, even the out-of-camera jpegs are impressively detailed, have lots of dynamic range and shadow detail, and just generally seem very "malleable" from a post-processing standpoint. One more lens-related (and rare) feature, is the inclusion of a 3-stop neutral-density filter. Having an instantly switchable 3-stop ND will be nice for getting the shutter speeds down in bright light to emphasize subject movement, or to get the aperture wide open in order to get more background blur and subject isolation. Oh and I almost forgot, the aperture is a 9-bladed design which stays almost perfectly circular over much of its range (f/2 - f/16), which also helps in rendering nice soft backgrounds and nice circular out-of-focus highlights. Continuous shooting performance sounds like it will be quite good also, with the X100 rated to achieve up to 5 fps... although with a buffer for up to only 8 raw files or 10 jpegs. The 8-shot raw buffer limit is one of the few disappointing aspects of the X100, but luckily there aren't many. While on the topic of disappointment, I'd also like to mention that I am somewhat saddened by the lack of half-stop settings on the aperture dial; I feel there is plenty of room between the existing detents for half stop settings. Since the aperture is electronically controlled and the f-stop ring only feels "mechanical" (but boy does it ever feel nice), one cannot cheat the detents and leave the ring halfway between two full-stop settings like one might on a fully-mechanical lens. The only time this will be an issue, I'd think, is when shooting in full manual mode. In aperture priority, having full-stop settings really won't be a concern in my opinion, but in manual mode, when carefully adjusting the metering, both the f-stop ring and shutter speed dials only have full-stop settings, which may be rather coarse when trying to achieve a perfect exposure. In all fairness, there is a way to set third-stops by using the small thumb actuated jog-lever on the back of the camera, but this will ruin the "perfect two-dial workflow" one could achieve, if only the f-stops were directly settable in half-stop increments! Yes I know... I am really nitpicking here, but hey, if I had nothing bad at all to say you might start to question the impartialness of this preview! Am I right? Flip the little red lever on the front of the camera, just below the shutter speed dial, and an internal electronic blind instantly closes the view from the optical viewfinder and converts the camera to pure EVF mode. In this mode, it will be possible to accurately frame macro shots (the lens focuses down to a very close 10cm) and also easily make menu selections and clearly playback images even when in bright sunlight. Cool! One feature which was not working right on the prototype I handled was that the optical viewfinder blind is (optionally) supposed to activate immediately after taking an image so one can see the captured shot. The image was showing on the EVF but the blind did not close automatically on the preproduction sample. Imagine that you are in an exotic city, concentrating on framing a shot, when suddenly a cyclist rides into the frame, or an interesting person walks into the scene. On a DSLR with a normal viewfinder, you would effectively have no advance warning that something interesting is about to happen if you are glued to that viewfinder. Having that extra second or so of warning, because you can see well outside the frame being captured, might make the difference between merely capturing that suddenly appearing subject somewhere in the frame (if you're quick enough), or actually getting the perfect shot with the subject exactly at the optimal position, compositionally speaking. Say you are framing a sunset shot at the beach, and suddenly a close-by seagull flies into the frame. Were you able to shoot at the right moment, or was the gull nearly out of the frame again before your reflexes kicked in? That extra bit of warning could make all the difference between just barely getting the shot, or getting the shot perfectly! 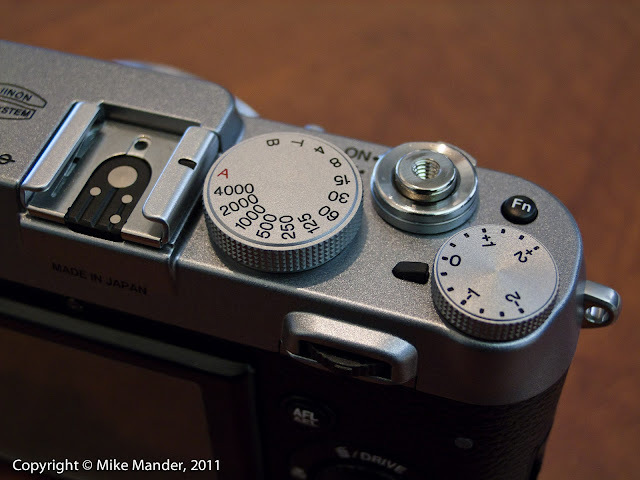 Those are some of the ways in which a rangefinder can be superior to a normal DSLR style viewfinder. There are many more interesting features and specifications I could cover - 720p HD movie recording, AF modes, the very nice rear LCD display, TTL flash cababilities, the Astia, Provia and Velvia film-simulation modes, dynamic range bracketing and more, but I will leave it up to you to visit the X100 website I linked to earlier on, for more details direct from Fujifilm themselves. Right now we are taking pre-order deposits ($200) at Beau Photo to reserve a camera on the first shipment although the pre-order list is getting surprisingly long. 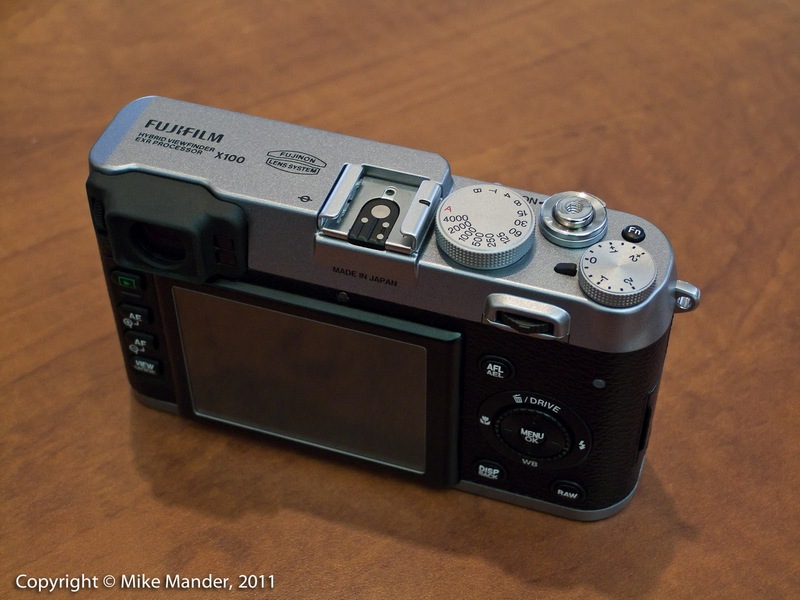 The X100 will be selling for $1199 CDN when it starts shipping in late March. There will be some accessories available as well, such as spare battery packs, filter adapter rings, a metal lens-hood / filter-ring combo and a premium leather case. 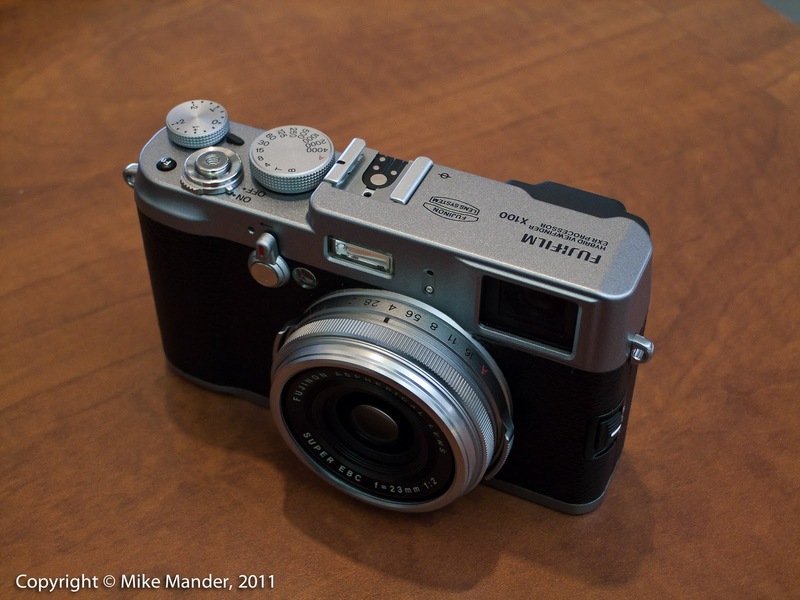 If you have a question about the X100 that I have not answered, or if you would like to be put on the pre-order list, feel free to call me at Beau Photo Supplies (604-734-7771). It's going to be a long month of waiting before the end of March arrives I think! Thanks for adding yet another goodie to my wish list Mike! very nice review! i have a question re video recording, AE mode only and auto, does it mean you can't set the shutter speed? It's early Tuesday evening and I'm looking forward to your comments on the day's photo shoot. Heh... cannot seem to edit my own comment on my own blog! Meant to fix a minor spelling error and mention that the blog link on the gallery page is not yet active. That is where my further comments on this X100 test will appear. At Fujifilm's request, I had to pull the samples gallery. The link in the above posting still works and explains why. My detailed comments to follow in a blog posting this weekend.